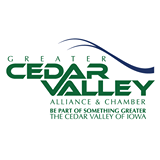 WATERLOO — The Greater Cedar Valley Alliance & Chamber will host Good Morning Cedar Valley, a quarterly networking breakfast for investors/members March 14. The event will be held from 7:30 to 9 a.m. at the Van G. Miller Adult Learning Center Hawkeye Community College, 120 Jefferson St., Waterloo. The March program will include briefings on current events by Cedar Falls Mayor Jim Brown, Waterloo Mayor Quentin Hart, a representative Black Hawk County Supervisor representative, and the Alliance & Chamber’s CEO, Cary Darrah. Each breakfast attracts more than 150 investors. There is no cost to attend. RSVP deadline is Thursday. For more information or to RSVP contact Bette Wubbena at bwubbena@cedarvalleyalliance.com or by calling 232-1156. CEDAR FALLS – KCVM-FM (93.5 The Mix) has been named a finalist for the 32nd annual NAB Crystal Radio Awards. The National Association of Broadcasters announced the 50 finalists for the award last week. Since 1987, the NAB Crystal Radio Awards have recognized radio stations for their outstanding year-round commitment to community service. Among the efforts noted for KCVM in their nomination is their Magical Mix Kids, a 501 (C3) charity run through the station that takes chronic and terminally ill children to Disney World each year. Winners will be announced and the finalists honored at the We Are Broadcasters Celebration, held Tuesday, April 9 during the 2019 NAB Show in Las Vegas. MEMPHIS, Tenn. — FedEx Corp. has announced the launch of its seventh annual Small Business Grant contest. The 2018 contest garnered nearly 665,000 votes and attracted more than 7,800 candidates from across the United States. Grand Prize winner Rumi Spice, a small Chicago-based business that sources and brings to market premier saffron from the fields of Afghanistan, was founded by former Army officer Keith Alaniz and two friends who, while serving in the war-torn country, realized the need to provide economic alternatives to opium farming for the Afghan people. The contest entry period is open through March 25, with voting to take place from now until April 1. Following a judging period, winners will be announced April 29 at www.fedex.com/grantcontest.